Two outstanding shows about people with eating disorders featured at this year’s Edinburgh Fringe Festival in August. 3 Years, 1 Week and a Lemon Drizzle is a jaunty piece energetically played by sisters Alexandra and Kate Donnachie showing the effects on both of them when Alexandra is told she has six months to live because of her severe anorexia nervosa. Some quick-fire dialogue establishes the sisters’ closeness but at times the friendly banter falters, revealing some uncomfortable emotions that still seem raw. Alexandra, the older by three years and one week, and the taller at five foot eleven, feels that as the big sister she should be strong and sturdy, but she has lost so much weight that Kate didn’t recognise her when she came home from university. The pace slows when they become more serious during a section in which they are to ask each other questions. When it’s Kate’s turn to ask the questions, Alexandra refuses to do this bit. Kate complains that she has tried to understand what was going on in her sister’s head, but she won’t open up about what is always referred to as ‘that time’. They each read from their diaries for 2015. Kate’s details her attempts to get a job in the theatre, while Alexandra’s lists meals she has eaten. While Kate is speaking, Alexandra slowly takes a large bite from a chocolate bar, then puts it back and tries to reassemble and repackage the bar. Her relationship with food still seems complicated. She regrets what she put Kate through during her illness, and for making her re-live it through this play. ‘No,’ says Alexandra, but sometimes they come up during consultations, such as when the practice nurse weighs her for another reason. When this happens she sings loudly so as not to hear the result – she doesn’t know, and doesn’t want to know, what she weighs. 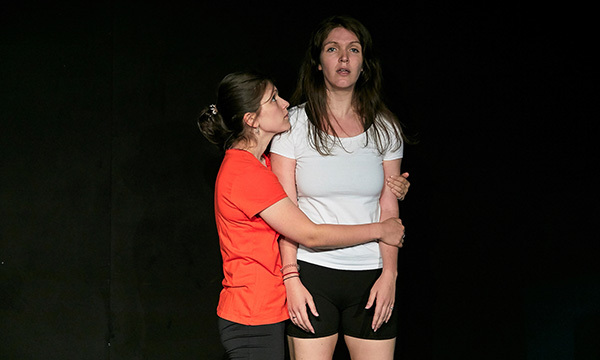 The play doesn’t explore the reasons for Alexandra’s anorexia, or what treatment helped her to overcome it, but it powerfully portrays the emotional impact of the illness on her and her sister. In the words of the old cliché, it’s a piece that makes you laugh and makes you cry. It’s good to discover that both sisters are now successful actors; Alexandra is also a writer, and Kate is a singer/songwriter. Eat Me covers similar ground, but approaches the subject of anorexia from a different perspective. Three characters – Libby, Kate and Jonathan – are introduced by an unnamed speaker, who says they were all very close to her for some years. Played by Suzanna Walters, who also wrote the play, the narrator is the personification of anorexia, always there to incite her protegees to refuse that slice of pizza, drink lots of diet cola, keep exercising and ignore people who urge them to eat more. Anorexia brings a sense of security through her seductive and comforting approach, reassuring them that she’ll keep them safe, and encouraging their complete dependence on her. Each character undergoes some form of hospital treatment, including being detained under the Mental Health Act and fed through a nasogastric tube, as they battle to wrest control of their lives from the ever-present anorexia, the irrational voice in their heads. Finally, all three characters begin to improve, they find peer-support helpful, and they vow not to listen to anorexia any more, recognising that it is truly malevolent and deceptive. 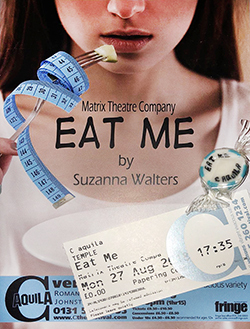 Suzanna Walters wrote the play from her own experience of anorexia, and everything portrayed in it has happened to her or someone she knows. It is designed to help people understand the condition, and she is collaborating with Sussex Partnership NHS Foundation Trust in their Everybody Campaign at an event for professionals working with young people on 10 October.